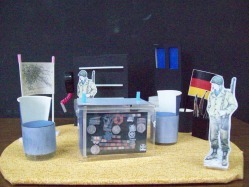 BISS follows the International Baccalureate Theatre program. We offer Standard Level and Higher Level students. 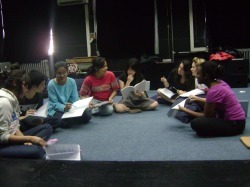 The Theatre students have 3 X double lessons of 80 minutes a week. At BISS we have a small annex that acts as a Theatre complete with lighting and sound. It allows for intimate performances. 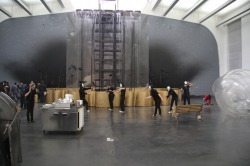 The Drama rooms comprise of two spaces - The Black Box - which has a little stage and lights and the Dance Studio - a small room with wooden floor. An introduction into Stanislavski and Realism. We used Buchner's play " Woyzech" and looked a different rehearsal techniques - including using Audacity and then onto research and stage designing. A very short unit that had a dramatic effect. Using Boal's idea of Invisible Theatre, we took the issue of the Dress code at our school and developed it into a piece of Invisible Theatre. It became known as the "Frena Incident" and we had to go around telling students it was an acutal performance. Using a variety of Physical Theatre influences, we went to UCCA - 798 Art gallery and used that as a stimulus for a perfromance that we perfromed back in UCCA and at the APAC festival at WAB. Inspired by a visit to the UCCA gallery in Beijing’s 798's art district, the Physical Theatre performance explores the enduring love between humans and their environment. The performance starts in the "primordial soup" changing into the world that lives and breathes. Trees are the first influence that the humans identify and experience - the joy and wonder. Soon this evolves into tools and machines which become the focus of human attention. It eventually becomes their focus and love which then threatens to destroy the environment. But life changes once again with the humans returning to the first love - the environment. And the full cycle of enduring love is complete. The students choose an area of interest in Theatre. They researched and then ran three 20-30 min workshop for Grade Five, Six and Seven. We used Survey Monkey to help analyse the responses. 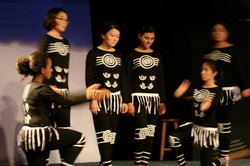 In 2010, the students examined Australian theatre, in particular Aboriginal Dance drama. Using Bruce Chatwin's book 'Songlines', the students created a student devised performance. 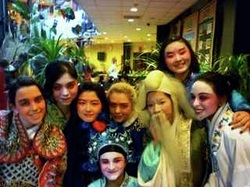 Each student acted in as director, dramaturge, actor and in a technical role.